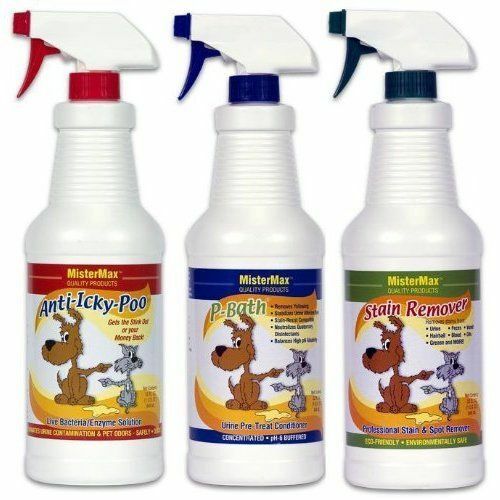 Complete any pet odor remediation job with the Anti-Icky-Poo 3 Quart Combo Pack. 1) Spray Mister Max P-Bath Urine Pretratment on Carpet or Fabrics if they have been previously treated with a bleach detergent of chemical cleaner. 3) Remove MisterMax P-Bath with hot water and clean towel, the immediately begin treating with Anti-Icky-Poo Original Scent Odor Remover. One Quart Each of Anti-Icky-Poo, MisterMax Stain Remover and Mister Max P-Bath Pre-Treatment. This product takes away order caused by pet urine better than any other product that I have tried. I have tried many products and no other compares.